Delivering entertainment to connected cars is about more than technology. Automotive OEMs need to provide a wide content choice to their customers and navigating this new frontier is challenging. Augmenting traditional audio services such as FM and DAB with streaming audio and video requires new business relationships and new technologies. 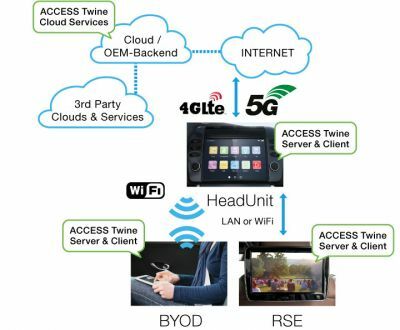 ACCESS Twine™ for Car (Twine4Car) enables automotive OEMs to provide branded entertainment services on the car head unit (HU) and rear-seat entertainment (RSE) units. Plus, with software development kits for Android and iOS, OEMs can extend to customer brought in devices (BYOD). Twine4Car spans the gap between the automotive and the content industries by enabling a content portfolio and helps increase the safety, the comfort, and the flexibility of content consumption for drivers and passengers. Through our extensive contacts and experience, ACCESS can also act as the single point of contact for the OEM engaging with broadcasters, media owners and the OEM’s Tier-1 suppliers to enable the integration and provisioning of state-of-the-art content and streaming services. ACCESS Twine™ for Car supports automotive OEMs in creating successful multi-device in-car platforms and facilitates driver and passenger consumption of media services. It enables exploration of new customer engagement approaches through the HMI and business models to create recurring revenue streams. Twine4Car allows OEMs to start with the services they wish to deploy today and add new services over time as the industry moves towards the various levels of autonomous driving. Twine4Car connects the in-car infotainment system components seamlessly with BYOD devices via the in-car Wi-Fi network. It provides a decentralized control of content that enables a multi-device user experience far beyond common single device streaming applications or screen mirroring technologies. A key value is that ACCESS Twine™ for Car fully supports the OEM’s brand experience across all devices. Being able to deploy a service delivering information and entertainment requires more than just a set of technology components. 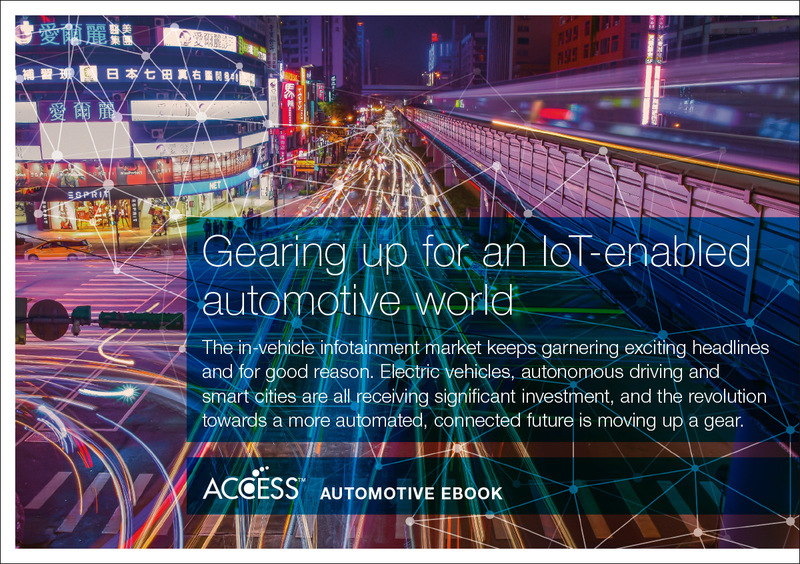 ACCESS Twine™ for Car enables automotive OEMs to deliver OTT content services, enabling reinforcement of the automotive OEM’s brand experience and their customers’ brand engagement. Extending the traditional in-car broadcast content offering can start by taking advantage of the in-car Wi-Fi network. ACCESS Twine™ for Car can index music from all devices, including USB drives, smartphones and tablets, within the car and allow playback on any Twine4Car enabled device such as RSE units, tablets and smartphones. Each individual device can listen to different content, providing an aggregated, yet personal, journey experience. Expanding to use the mobile data connection (3G/4G/5G) further broadens the options for the automotive OEM to streamed over-the-top (OTT) linear audio content such as Internet radio. On-demand streamed audio services, such as music services and podcasts, can be added to provide drivers with the widest range of audio options. Utilising screens in the car for additional services for passengers ACCESS Twine™ for Car provides automotive OEMs with new options to stretch their brand engagement and move beyond driver focused audio-only services. As with audio, Twine4Car supports in-car sharing, enabling viewing of videos and photos from BYOD devices between passengers and to RSE units, again using the in-car Wi-Fi. TV channels can be offered via OTT streaming, with options to access via an integrated electronic program guide (EPG) or via an “app” style approach depending on the automotive OEM’s preference. Video entertainment choice can be extended further by adding access to on-demand content such as video-on-demand services (“VOD”) and broadcasters’ catch-up TV content. Twine4Car supports HTML5 and therefore is ideal for accessing online video portals. A new area for automotive OEMs - when adding video to their entertainment portfolio - is content protection. To address piracy concerns, content rights owners will mandate end-to-end protection of their assets before in-car viewing is allowed. To address this, ACCESS Twine™ for Car supports Digital Rights Management (DRM) within the car’s built-in devices and brought-in devices for secure playback. ACCESS Twine™ for Car includes a portfolio of technology components to enable automotive OEMs to deliver the services they require today and extend to new services in the future. Streaming services utilize Wi-Fi and mobile Internet connectivity and is therefore independent from changes in broadcasting infrastructures so there will be no need to change physical components such as hardware tuners in the future. Additionally, Twine4Car includes cloud-hosted components for operations and business support services (OSS/BSS) to help automotive OEMs build and refine the entertainment packages that suit their customers, log usage information, register in-car devices, and more. The cloud components of ACCESS Twine™ for Car can be installed within the public cloud or the OEM’s cloud or backend infrastructure. ACCESS Twine™ for Car is integrated with the OEM’s customer management platform ensuring that the OEM is always in control of the data exchanged with the car. ACCESS Twine™ for Car is based on open standards for device discovery and management, extended with support for DRM technologies that provide the latest levels of content security demanded by content owners. ACCESS are experts in delivering connected media and multiscreen components, with over 20 years of experience in the automotive and media consumer electronics industries, making us ideally placed to bridge the gap between the media industry and the automotive market. Our knowledge and experience enables OEMs to launch the entertainment services their customers are asking for, maintaining brand engagement by offering a truly multi-device experience compared to mobile device screen sharing solutions. With offices worldwide, we offer global coverage and multi-language support for OEMs and Tier-1s. Playback control: Play, Pause, Resume, Stop, etc.